The Original Big Wheel Girl's 16" Racerwith Flag and Licence Plate . This Model made in USA! Expedited & International Shipping is available. 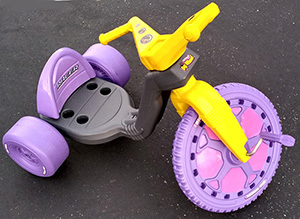 The 95% Assembled = We assemble the trike completely, attach the decals, make sure everything is OK, Then take the handle bar and rear wheel off. Ships in a plain brown box. You just need to drive 2 attached screws into the handle bar and attach rear wheel with 1 cap nut. It would take only 1 minute to complete, comparing to up to 1 hour for an un-assembled one. This Model will be shipped in a plain brown box. This Model made in USA. Please Note: The shipping added automatically is for Continental USA, all other locations must be added manually from the Shipping Options Table.